This is the eighth post in our series looking more closely at gemstones in Hasso bike chain cufflinks. This blog post will be about another of the newly released cufflinks: genuine moonstone cufflinks. To read more about the moonstone gem, please click through to the moonstone article linked here. We use natural white moonstone for the bike chain cufflinks. The base colour is white to translucent and the stones have blue sheens. The stone is reasonably hard, but care does need to be taken when wearing genuine moonstone cufflinks to avoid chipping or scratching. Moonstone is a June birthstone. It is also the 3rd wedding anniversary gemstone. If you want more information about the moonstone as a birthstone, understand more about the quality of moonstone, some of the benefits, figures and facts then click through to the moonstone birthstone blog post which is covered in the June birthstone post. The moonstone bike chain cufflinks are made in the UK, between Newcastle (where they’re turned into cufflinks) and the south coast (where they’re plated). The pieces of real bike chain are plated in rose gold, silver, or gold and set with carefully selected and matched sets of genuine moonstones. We choose the moonstones for quality, to always find ones with a bright blue flare. The moonstone jewelled cufflinks are presented in a wooden cufflink box, which is finished with a traditional red wax seal to make a memorable and unique gift. 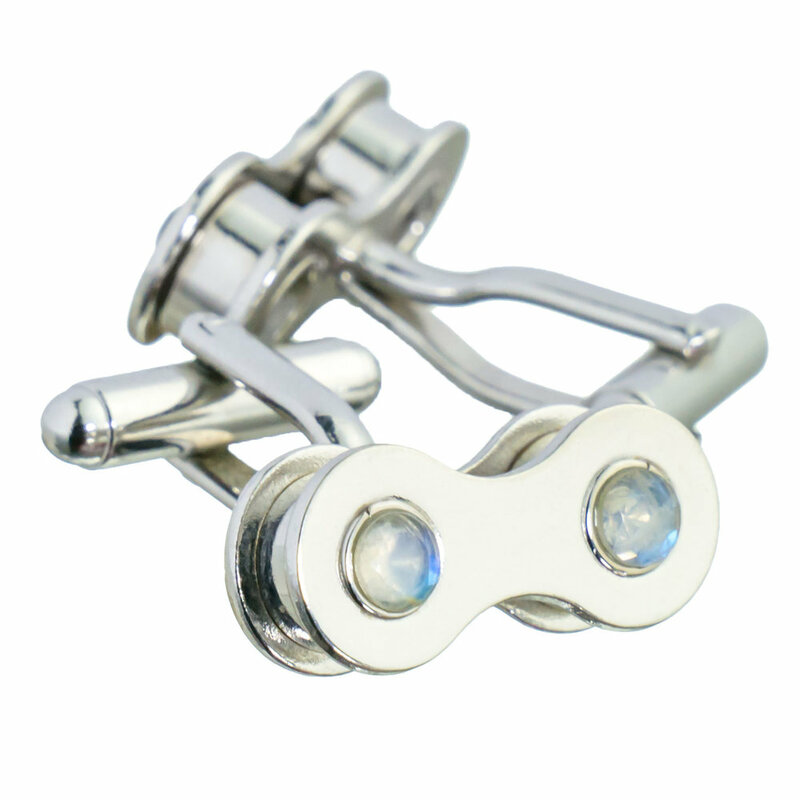 Moonstones are new to our range of bike chain cufflinks. Together with labradorite, opal, rhodolite they were shown to trade in the Home and Gift tradeshow in Harrogate and then in the Birmingham NEC Moda Fashion tradeshow in 2018. Following those two UK trade shows, the moonstone cufflinks went on to public release. Together with a few of the newer additions to the cuff link range, the moonstones add a smaller capsule collection of three muted and understated stones, contrasting with the higher sparkle gemstones in the rest of the range. In case you were wondering, the other two subtle gemstones are opal and labradorite. The muted stones add a unique texture to the range. The texture is emphasised when the moonstones are set in the highly polished cufflinks. Moonstone cufflinks have a few benefits that other gemstone cufflinks do not. Or at least moonstone cufflinks represent the best examples of them when it comes to difficult pairings. The first big benefit is when pairing cufflinks with bright dress shirts. This can be brightly patterned or bright solid colour dress shirts. With these styles of double cuff shirts the creamy/ white moonstone texture comes to the fore. This white texture is such a strong feature, that it can contrast even the brightest and most highly patterned shirts. If you find yourself with a crazy patterned shirt and are choosing which moonstone cufflinks to buy then the answer is straightforward. Simply pick one of the shirt pattern colours to match with the cufflink metal. Think yellows = gold cufflinks, reds = rose gold cufflinks, white or blue = silver cufflinks. Following these simple rules when wearing a brightly patterned slim fit shirt is sure to set your moonstone cufflinks off perfectly. The second benefit comes when wearing formal shirts with cufflinks. And it happens because of the blue shimmer of the moonstones. Because this blue colour is only visible from certain angles, the cufflinks can be paired with a white double cuff shirt perfectly. The blue glimmer has more excitement than pearl or mother of pearl cufflinks. Pairing with a light blue double cuff shirt works equally well. Moonstone cufflinks are ideal when wearing striped shirts with white collars and cuffs. This is because of the combination of the white moonstone and the blue sheen. Cufflinks can often look out of place on the white cuffs of these shirts. This is because they don’t suit either the body material or the white cuff well. However, the blue and white in moonstone cufflinks combine to perfectly suit striped shirts with white collars and cuffs.